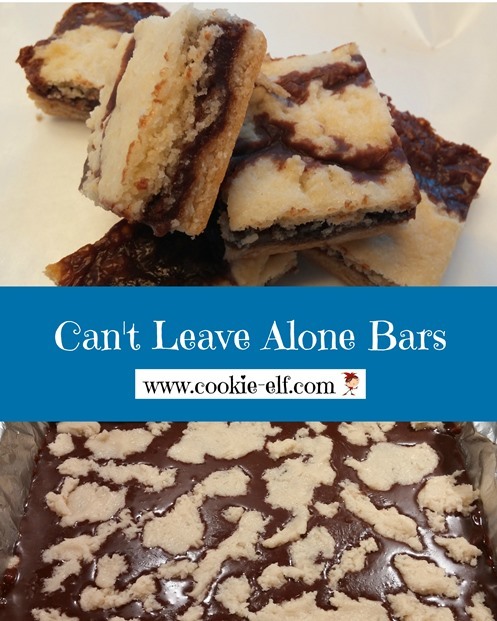 Can’t Leave Alone Bars (also known as Can’t Get Enough Bars) is a simple, easy cookie recipe that was first published in Quick Cooking magazine in 2001. The bar cookies are true to their name – people cannot eat just one and leave them alone – and their popularity caught on quickly. 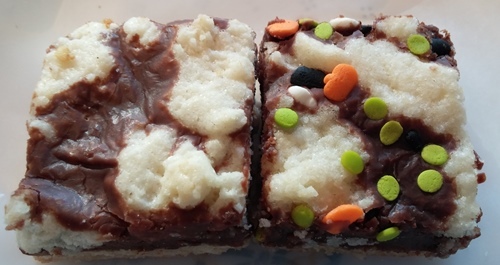 When made for a gathering, potluck, party, or just dessert, these bar cookies are the first to go.The recipe is constructed in 3 layers, with the bottom and top layers made of the same mixture – and a cake mix at that. The middle layer, made of melted chocolate, is poured over the crust. Different cookie elves construct the top layer different ways. Some drop spoonfuls of the mixture on top of the smooth middle chocolate layer. This creates hardened lumps on the cookie surface and may propel you to over bake the bars. Other cookie elves sprinkle the remaining mixture over the chocolate, which creates a crumbly texture. The Elf advises against both those approaches. Instead, the best method is to flatten teaspoonfuls of cookie dough between your hands and arrange them across the surface to fit together, allowing chocolate to peek through. This creates an even top layer, which lets bars bake uniformly. Preheat oven to 350°. Line a 13 x 9 baking pan with foil. Spray foil lightly with vegetable spray. In a large bowl, combine the cake mix, eggs, and oil with a large spoon (or with an electric mixer on low speed) until just well blended. Press half to two-thirds of the mixture into the prepared baking pan. Set remaining cake mixture aside. In a microwave-safe bowl, combine the sweetened condensed milk, chocolate chips, and butter. Microwave uncovered for 30-45 seconds. Stir. Repeat until chips and butter are melted and mixture is smooth. Pour chocolate mixture over crust. Take a teaspoonful of remaining cake mixture and flatten it between your hands. Lay flattened dough on top of chocolate layer. Repeat with remaining cake mixture, arranging flattened dough pieces across the chocolate surface. Chocolate will be visible in gaps between pieces of dough. Bake bars 20-25 minutes. Do not over bake or bar surface will become hard. Cool bars completely on a wire rack. Lift foil ends to remove bars from the pan. Cut bars into 7 x 5 rows or other size depending on your preference. Store bars in an airtight container with waxed paper between layers. You can vary Can’t Leave Alone Bars by making a chocolate version, using a chocolate cake mix and butterscotch chips, or a strawberry version, using a strawberry cake mix and white chocolate chips. Adapt the bars to any holiday by sprinkling the top layer, before baking, with colored decos, nonpareils, or sprinkles that are appropriate for that season.